This Independent Publication of The Art For Arachnoiditis Project is self-published by Arachnoiditis Survivors and printed at Blurb. An e-book version is also in the works for iPad users. 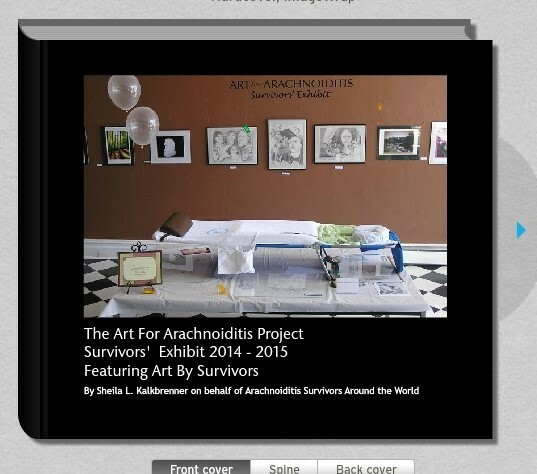 After the cost of publication, $10 of your purchase benefits the Art For Arachnoiditis Project. These fair market prices are NOT tax-deductible. Not ready for the book but want to support The Art For Arachnoiditis Project? Tax-deductible Contributions are accepted by our Fiscal Sponsor, The New York Foundation for the Arts. Or by check payable to the New York Foundation for the Arts, Memo: The Art For Arachnoiditis Project mailed to: SheilaLynnK Art Studio, 345 South Main Street, Wellsville, NY 14895.